California Highway 68 is a very short road, running just 24 miles across Monterey County from the cities of Pacific Grove and Monterey on the ocean to the inland city of Salinas. In today’s California, the path between great wealth and poverty is rarely very long. Californians often talk about the inequality between our regions—between our prosperous large cities and poorer rural communities, between the gilded coast and the gritty inland. But the greatest inequality in our state lies within our regions, not between them. Seeing this intimate, local inequality doesn’t take long. Just cross the bridge from San Francisco to Richmond. Take the bus from Sherman Oaks to the northeast San Fernando Valley. Ride your bike down the hill from Palos Verdes into South L.A. Or drive from La Jolla to City Heights. The canyons between such places are as dramatic as our landscapes—and define us as a state. The fact that local inequality is greater than statewide inequality is especially troubling because California is among the most unequal states in America, with the richest of the super rich and the highest poverty rate (by advanced measures that account for government assistance and the cost of living). Worse still, our inequality has been growing faster than the country’s over the past several decades. The killer stat, courtesy of USC: while the income of California’s top 1 percent increased nearly 200 percent between 1979 and 2012, the incomes of the rest of us actually fell by 6 percent over the same period. The factors behind this growing inequality—involving complex changes in immigration, technology, the value of education and job skills, and the migration of poorer people to some suburbs and midsized cities—are all part of the story of Highway 68. The divide that 68 spans—between the wealth of the Monterey Bay peninsula and the poverty of Salinas, the Monterey County seat—goes beyond economics and education to mindset. To go from one end of 68 to the other—as I did recently (it’s a 45-minute drive)—is to “cross the Lettuce Curtain,” in local parlance. That’s more than a nod to Salinas’ most famous agricultural product. It’s a way of conveying that so many people in Monterey see Salinas, with its crime and gangs, as a no-go zone. That’s a shame for many reasons, including the beauty of the drive. I started my own journey across the Lettuce Curtain at the beginning of 68, at the windy and beautiful Asilomar State Beach and Conference Grounds, where rooms were running $250 to $300 a night. The highway took me first through Pacific Grove, a prosperous village (low unemployment, a median house price north of $700,000, and a poverty rate of 9 percent, roughly half the statewide rate) known for its crafts and vintage stores, and good restaurants. I had to turn right to stay on 68 near the gate to 17 Mile Drive, the scenic coastal road that takes you to world-renowned resorts, golf courses, and mansions. I continued south on 68, where it forms the western boundary of the city of Monterey (another place with a low unemployment, and incomes and housing prices well above state averages). Then I turned to the northeast, as 68 joined up with Highway 1 for two and a half miles, past downtown Monterey, before splitting again near Seaside, not far from the site where Tesla Motors plans to open a new sales, service, and charging center. This stretch of 68 is officially a California Scenic Route, with chaparral and lupine to behold. I passed the Monterey Regional Airport, leaving behind the city of Monterey. The highway lay low there, with hills and canyons and developments along the side for nearly the rest of the journey. And so I passed Pasadera (with a Jack Nicklaus-designed golf course), an auto racing track, and Fort Ord National Monument, the former U.S. Army outpost (where my dad served before going to Vietnam). Then suddenly, the highway opened up, becoming a freeway for the last three miles before Salinas. The landscape opened at the same point, with the hills falling away to reveal the Salinas Valley and fields. I felt that I was descending into a different world. It’s certainly different from Monterey. Salinas, pop. 155,000, has many strengths, but it’s a poor place. While Monterey and Pacific Grove are older and more U.S.-born and better educated (nearly 50 percent have bachelor’s degrees) than California as a whole, Salinas is younger, more foreign-born, and less educated (12 percent have bachelor’s degrees) than the rest of the state. There is great potential in Salinas—young people are precious assets in our aging state—but the city has struggled to do right by its children. Youth violence rates and child poverty are among the highest in the entire state. Unemployment remains at 8 percent, almost two points above the state average. Salinas’ proximity to wealth adds to its challenges. Land values are high, and so are housing costs; rents for two-bedroom apartments in Salinas are higher than in Seattle or Miami. 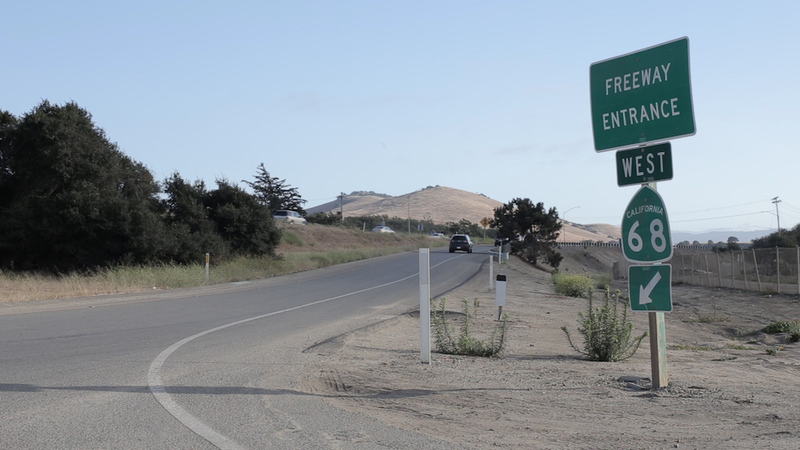 In Salinas, there is resentment towards the other end of Highway 68. (One Salinas journalist, when I asked about Monterey, answered darkly that Salinas was just “one tsunami away from greatness”). Some ask why Monterey environmentalists don’t fight as hard against pesticides that get into Salinas schools as they do against coastal development. Others complain that Monterey is a magnet for investment and jobs, which relegates Salinas to serving as a place for people who can’t afford to live near their work on the peninsula. You can see this dynamic in the Highway 68 traffic patterns; the cars back up going into Monterey in the morning, and heading back to Salinas in the late afternoon. On my own drive, I reached Salinas and followed Highway 68 past farms, Salinas High School, and a mix of retail to downtown, where the highway became Main Street. Then Highway 68 turned right and ended at the 101. There I faced a choice. I could go south on 101 towards small Monterey County communities that are poorer than Salinas. Or I could head north, crossing another divide, and arrive an hour later in the Bay Area, the richest mega-city in the richest country on earth. Joe Mathews is California & innovation editor for Zócalo Public Square.This column is part of Salinas: California's Richest Poor City, a special project of Zócalo Public Square and The California Wellness Foundation. Primary Editor: Andrés Martinez. Secondary Editor: Becca MacLaren. *Photo courtesy of Eric Gutierrez.